Jobs Description: Jinnah Hospital Lahore Jobs February 2019 are listed below in our site. 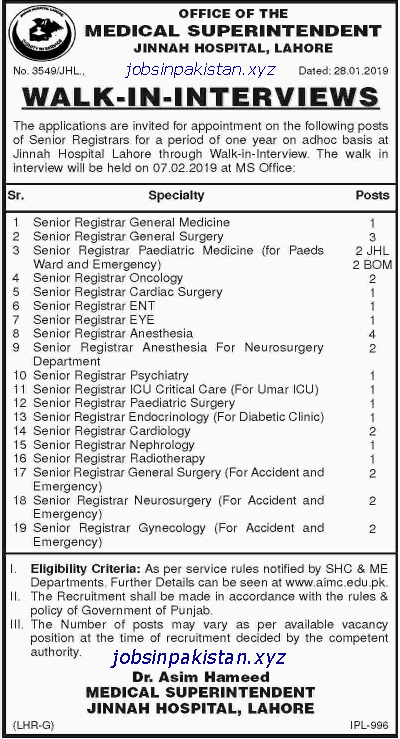 Jinnah Hospital Lahore recently announced an advertisement for Jobs of Senior Registrars. Jinnah Hospital is one of the best Hospitals in Lahore and Pakistan. Jinnah Hospital Lahore has required the applications for following jobs. How To Apply: Others details are available on AIMC (Allama Iqbal Medical College) website.